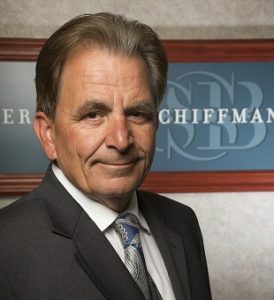 John D. Sheridan – Schiffman Sheridan & Brown, P.C. John D. Sheridan concentrates his practice in the field of Business, Taxation (including individual, corporate tax matters, as well as Estate Planning and Administration), and business succession planning. He also provides counsel in the areas of commercial and tax litigation. Mr. Sheridan graduated with highest distinction from the Pennsylvania State University with a Bachelor of Business Degree majoring in accounting with a minor in finance. He graduated with highest distinction from Drexel University with a Master of Science Degree in Taxation. He received his Juris Doctorate degree from the Widener University School of Law. Mr. Sheridan began his professional career in 1973 with the international accounting firm of Ernst and Young. He was a Manager in the Tax Department of the Harrisburg office when he left the firm to form Sheridan and Fritz, P .C. Mr. Sheridan was managing partner of this CPA firm from the time of formation until it merged with another CPA firm, which then became known as Brown, Schultz, Sheridan & Fritz. This firm is one of the largest local accounting firms in central Pennsylvania. Mr. Sheridan is a Certified Public Accountant and a Certified Fraud Examiner. He is admitted to the United States Supreme Court, the Supreme Court of Pennsylvania, the Supreme Court of New Jersey, the U.S. District Court for New Jersey, the Middle District of Pennsylvania and the United States Tax Court. Mr. Sheridan is active in local charitable, civic and professional organizations.